Basically, there are two most common types of filing cabinets: vertical and lateral. The vertical file cabinet constitutes of drawers that extend from the shorter side of the cabinet. On the other hand, the lateral file cabinet contains drawers that extend from the longer side of the cabinet. The lateral file cabinets are commonly known as side filers in the United Kingdom. Different Types of File Cabinets If you always feel that your desk has become a mess with documents, loose papers, forms, and files lying here and there, then file cabinet is the furniture you need instantly. However, deciding to buy a filing cabinet and purchasing it, in reality, are two different things. 1. Letter Size: These are the documents that can be easily stored by all types of filing cabinets. The size of a standard letter size document is the same as that of a computer paper of size 8-1/2” x 11”. 2. Legal Size: These documents are not accommodated by all the filing cabinets in the market. Therefore, reading the product description is important while purchasing a new filing cabinet to see if it supports the legal size or not. The size of this document subtype is 8-1/2” x 14”. With a number of cabinets available in the market with different specifications and designs, it becomes cumbersome to select the optimum item for your office. In this section, we will like to classify different filing cabinets on the basis of their structure, shape, and usage. Lateral File CabinetsLateral file cabinets are specifically designed to be used in highly competitive and busy work environments. Intrinsically, they are wider but have a limited depth that makes them effective for high capacity filing. They are structured to provide you with a large space for the store, and the unmatched ability to organize your paperwork. The basic design of a lateral cabinet includes two or more drawers, equipped with an anti-tip mechanism. The anti-tip mechanism supports the cabinet from falling over, in case a drawer is completely open. As the lateral cabinets are structurally wider, filing is specifically done from side to side. Due to their large size, they are able to store both legal and letter size hanging folders without any hassle. However, as the lateral filing cabinets feature shallow drawers, they are most commonly used for walkways and areas with some space constraints. In addition, they are also low-profile in shape so that they can be fitted under a work desk easily. Vertical File CabinetsThese are the type of cabinets used in workspaces with a lot more scarcity of space. The unique feature of this type of enclosure is that it has a high number of drawers; however, each drawer is narrow in size. The stored documents, files, and folders in this type of cabinets are arranged in a front-to-back formation. In comparison with lateral cabinets, the vertical cabinets are deeper. While the lateral file cabinets are suitable for you if you require high storage capacity, the vertical file cabinets are suitable for you if you want a piece of furniture for everyday use. Contrarily, drawers in a vertical cabinet require sufficient clearance space to fully draw them out. Hence, to purchase such a file cabinet, space assessment is mandatory. Mobile File CabinetsThese types of cabinets are a convenient option for storage as they provide you the option to be rolled around where they are required. The main concept behind the design of mobile filing cabinets is to provide maximum storage space while taking a little floor space. They have four or five wheels under the bottom drawer that adds stability to the structure and the ability to be moved around easily. Generally, mobile cabinets are equipped with a minimum of two drawers, which can be both vertical or lateral. Most of the mobile cabinets are specially designed in such a way that they could easily fit below a work desk to save space. Some mobile cabinets are double-faced, which means that the cabinet can be rotated both the ways to reveal a separate column of files on either side. Furthermore, mobile cabinets are able to handle both letter and legal papers, as well. However, their only drawback is their compact size which prevents you to store a large number of letter files. Open Shelf Filing CabinetsThis category of file cabinets is typically wide and shallow in its structure. Most of the open-shelf filing cabinets resemble bookcases and bookshelves. In terms of design, the open shelf cabinets have an open front, which makes them suitable for storing end-tab folders. They are typically designed for areas with scarce space and narrow aisles. They are more commonly fitted in hospital and pharmaceutical shops. Side Tab File CabinetsThis type of file cabinets organizes your documents in the vertical pattern. Side tab filing cabinets are prominently used in medical record keeping. Their use allows easy access to files by allowing the users to locate the name on the folder tab quickly. 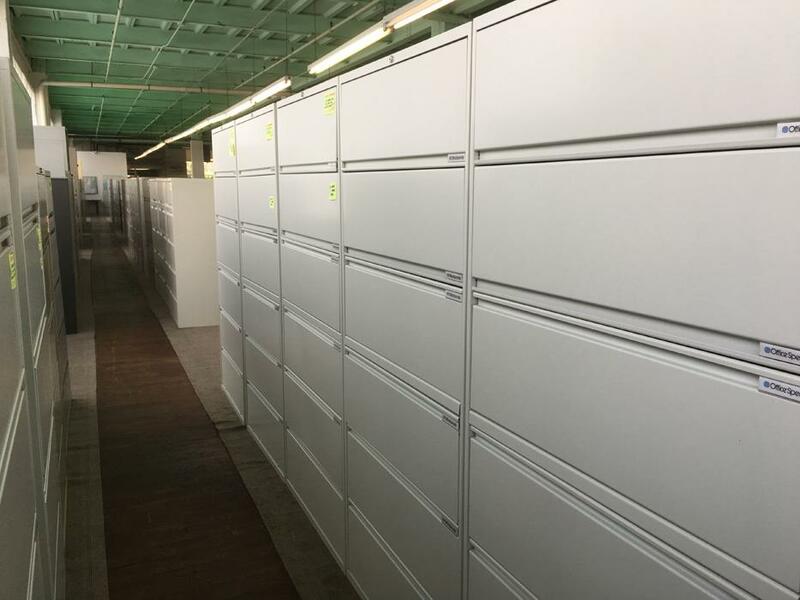 In addition, many of the side tab filing cabinets are available in different types and categories such as: with doors, without doors, and swinging doors. Flat Filing CabinetsThis category of filing cabinets is recognized by its flat and shallow drawer design. They are specifically designed to store large and flat items in a hassle-free way. Typically, flat cabinets are used to store blueprints in an organized and secure manner. Besides, flat files can be stacked on the top of each other to increase the workspace area. Storage Islands This is the term used for a combination of two or more cabinets with a counter height work surface. Storage islands are typically utilized for employee workstations. They prove to be an excellent storage solution along with being ideal for collaboration and casual meetings, too. Fireproof Filing Cabinet This category of cabinets is dedicated to safeguarding sensitive and confidential documents and papers. As the name suggests, this type of filing cabinets protects your files from any fire-related accident such as the damage caused by open flames. Besides their fire-resistant qualities, the fireproof cabinets are also water and theft resistant. Thus, providing you with an all-round security for your confidential papers. The fireproof cabinets are available in both the vertical and lateral types. The most common application of fireproof is found in big companies and corporations where confidential documents require security.